To conduct an empirical study profound knowledge of the various marketing research phases starting with the study design up to the documentation of the results is a necessary requirement. This book covers the whole process sarting with data conduction methods to various quantitative data analyses, and enables therefore the specific application into practice through by means of one case study. 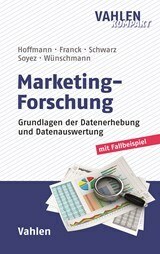 The authors highlight the process of marketing research from the general concept of an empirical study to the meaningful documentation of the related results. Furthermore, they have a closer look on data conduction (especially different data conduction approaches, sample selection, development of questionnaires and scales) and on scientific requirements like different quality criteria of measurement instruments (e. g. reliability) and hypotheses development. On the basis of that, fundamental multivariate analyses (analysis of variance, factor analysis, regression analysis and cluster analysis) will be presented. This textbook deals with the central question whether and how advertisement influences our purchase decision making process. Therefore, it takes a look on the core elements of consumer behavior and market research. Hence, it conveys clearly the fundamentals of consumer behavior with use of concise language. Why is the shopping trolley fuller as planned? Why does everybody want the newest smartphone? 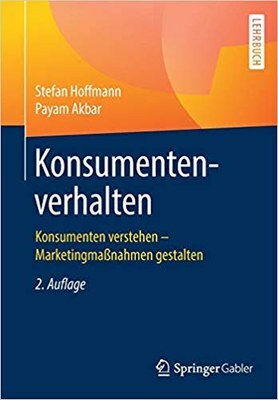 In their book "Konsumentenverhalten" the authors Stefan Hoffmann and Payam Akbar begin with the conception of consumer behavior and outline shortly the theoretical and methodical approach. Furthermore, they discuss impacts on consumer behavior which mainly take place in our inner: Motivation, emotions, cognitions, attitudes and decision making. On the basis of that, they show that the behavior differs systematically between various consumer groups. Therefore, they have a closer look on the impacts from a social, physical and medial environment. Finally, they clarify how the purchase decision making is embedded in the general social development and hence changing over time. This second edition was edited and updated by the authors. Unconventional marketing activities as guerilla marketing activities are widely adopted in business practice. Guerilla marketing methods can gain the attention of consumers and hence increase the advertisement efficiency. Katharina Hutter and Stefan Hoffmann highlight guerilla marketing for the first time practice-oriented and on the basis of recent scientific evidence. They provide practicioners a fundamental argumentation basis for customers, clients and managers. Fundamental knowledge for the successful development of innovative marketing campaigns and concrete activity suggestions can directly be transferred or used as a first approach. The authors demonstrate the effect of various guerilla instruments and how activities can be evaluated through scientific methods.